Verizon Wireless has just confirmed that the long-coming and much rumored HTC Droid Incredible 4G LTE is finally coming to the carrier on July 5th. If that date sounds familiar, it’s because we’ve already reported on it as it leaked out in a document last week, and now it’s all finally official. The Verizon Droid Incredible 4G LTE will set you back $150 if you pick it up on a two-year contract with the carrier, but initially you’d have to pay $200 and wait for a $50 mail-in rebate. The Incredible 4G LTE comes with a dual-core 1.2GHz Snapdragon processor, and runs on Android Ice Cream Sandwich. HTC is also bringing Beats Audio in this and baked in Android Beam with NFC so you can tap your phones to instantly share contacts, pages and more. BASKING RIDGE, N.J., July 2, 2012 /PRNewswire via COMTEX/ -- Announced earlier this year at the International CTIA WIRELESS® 2012 show, the DROID INCREDIBLE 4G LTE by HTC, will be available in Verizon Wireless Communications Stores and online at www.verizonwireless.com starting July 5. 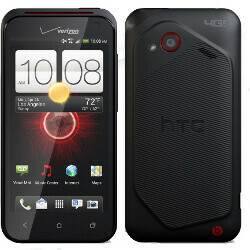 Customers who rely heavily on their mobile devices will find everything they need in the DROID INCREDIBLE 4G LTE by HTC. Running the latest version of HTC Sense® 4, HTC's branded user experience, integrated with Google's(TM) mobile operating system, Android(TM) 4.0, Ice Cream Sandwich, customers can take advantage of an enhanced mobile experience and enjoy the latest Android features, as well as the power of 4G LTE speeds. Every aspiring shutterbug will have something to smile about when they experience the amazing 8-megapixel camera with quick activation from the home screen so customers never miss that perfect shot. Additionally, HTC Video Pic(TM) allows customers to simultaneously shoot HD quality video and take pictures at the same time. Uploading photos or videos onto social networking sites or sharing through e-mail takes only seconds with 4G LTE speeds. The Verizon Wireless 4G LTE network is available in 304 markets across the United States. In real-world, fully loaded network environments, 4G LTE customers should experience average data rates of 5 to 12 megabits per second (Mbps) on the downlink and 2 to 5 Mbps on the uplink. When customers travel outside of 4G LTE coverage areas, devices automatically connect to Verizon Wireless' 3G network, where available, allowing customers to stay connected from coast to coast. Authentic Sound: Customers will benefit from Beats Audio(TM), an enhanced auto tuning technology that allows users to hear music the way the artist intended. Beats Audio is incorporated across the entire experience for richer, more authentic sound and whether watching a video or playing a game, customers are sure to be impressed with the sound quality. Read Later: Active readers who are constantly on-the-go can use the Read Later feature to save online content, such as news articles and website pages, to view later, even when they are offline. Android Beam(TM): Sharing YouTube videos, Google Maps locations and more with others is faster and easier than ever with Android Beam. Android Beam is as simple as tapping two compatible phones together for users to instantly share information. The DROID INCREDIBLE 4G LTE by HTC will be available beginning July 5 in Verizon Wireless Communications Stores and online at www.verizonwireless.com for 149.99 after a $50 mail-in rebate with a new two-year customer agreement. Customers will receive the rebate in the form of a debit card; upon receipt, customers may use the card as cash anywhere debit cards are accepted. For additional information on Verizon Wireless products and services at a Verizon Wireless Communications Store, call 1-800-2 JOIN IN or go to www.verizonwireless.com . Curious to see battery life with a Krait and a smaller, lower resolution screen. Might be pretty good. Still wish HTC would've squeezed a bigger battery in this biotch, though. What's wrong with rezound? You'd pretty much downgrade with this midrange handset in my opinion. Not really. The processor in the Incredible 4G is newer and more efficient. The Incredible has ICS NOW with Sense 4 with it's customizable dock, though Sense 3.5 is quite good as well (but a bit redundant). The 4" screen won't be sucking as much juice as the Rezound's and the body is thinner (again not much of a problem on the Rezound but hey, thinner is thinner). Also, 4" - 4.5" is my optimal range but I'm not interested in the Nexus. Also, nice of some jackoff marking me down. exactly! i refuse to get a phone with a screen larger than 4" exactly. i've toyed with getting a 4.3" so many times (rezound) but... i just couldn't do it. i IMMEDIATELY fell in love with the Dinc2... and when i saw this i almost cried with joy. it's really too bad i probably won't be willing or able to get it because of verizon's stupid rule to sacrifice unlimited data... i refuse to do so until they rework their data tiering.. 2gb - $15 4gb - $25 6/8gb - $30 10gb - idk.. 50 maybe... i just feel like that would be much more fair than 2gb for 30 a month.. edit: i just went to the verizon website... i can't even seem to find the tiered data pricing at all... all i see is the shared? anyone have a link? Pass......I am sure it is a good phone but with phones like the Galaxy SIII coming out for basicaly the same price for a top of the line phone I just don't see it. I know of course it is $50 cheaper after rebate but who wants to mess a rebate these days. Darn I just got Droid RAZR little over a month ago and I am so unsatisfied with it. My last two phones were HTC (Incredible then Thunderbolt) and they ran great and I liked the how HTC laid everything out. To bad for me I am stuck with this until I get some money to buy the HTC. best buy already said they will launch this at $99.99, the price it should be at.